Various kinds of fabrics are used as part of portable fabric building in construction industry. Some of the common fabrics include Cotton canvas, Polyesters, Vinyl-laminated polyesters, Vinyl-coated polyester, Fiberglass, Olefin / polyolefin, PVDF woven and ePTFE woven. Some of the properties that are considered while preparing various kinds of modular structures include tensile strength, tear strength, adhesion strength and flame retardancy. The structural properties as well as cost will be taken into consideration before finalizing the design. There is great demand for modular structures in construction industry. There will be great requirement to store various items at the time of construction. It is required to provide temporary accommodation for workers as well. Truss frame designs with clear span can provide lots of space so that you will be able to use for diverse needs. There are varieties of profiles and door systems so that you can create a modular structure of your choice. The structure can be planned to include various internal and external loading mechanisms. 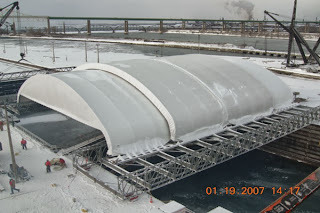 You can go for pre-engineered fabric structures for various purposes besides being used in construction industry. They can be used for environment remediation enclosures, military and government and aviation industry. Various kinds of accommodation camps can be created in construction industry. There will be hectic activity and the activities will be shifted from one location to another location. 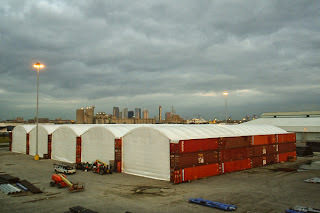 Companies can save lots of time and money by going for temporary structures. There will be fewer burdens on the budgetary allocations. Fabric properties such as tensile strength tear strength, adhesion and flame retardancy should be considered before finalizing the structure. Well built fabric structures can withstand load ratings that range between 75 and 120 miles per hour speeds of wind. There are wheel mountable structures so that you can move them from one location to another location. In most of the cases, fabric buildings do not require foundations. Hence, there are very portable. These are economical, durable and can be installed quite easily. By engaging the most competent agency in your location, it is possible to make the most from your investment. It is possible to roll out projects very quickly. There are numerous industrial as well as commercial applications that can be carried out through modular designs. By going for the most optimum design, you will not spend in excess. The capital will not be locked for unproductive purposes. Some structures can be managed through cranes as well.